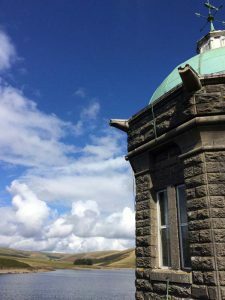 The still-immaculate OS map I bought just a couple of hours ago in the Elan Valley visitor centre is perched on a dam wall 120ft up. I’m tracing Esgair Perfedd with my finger and wondering whether I can squeeze a loop of an extra five or six miles into my walk. The walk is already 10, maybe 11, miles. It was supposed to be six. I planned to circle one reservoir and now I’m standing at the third. As I said, I’m in the Elan Valley. It’s hard to stop walking. 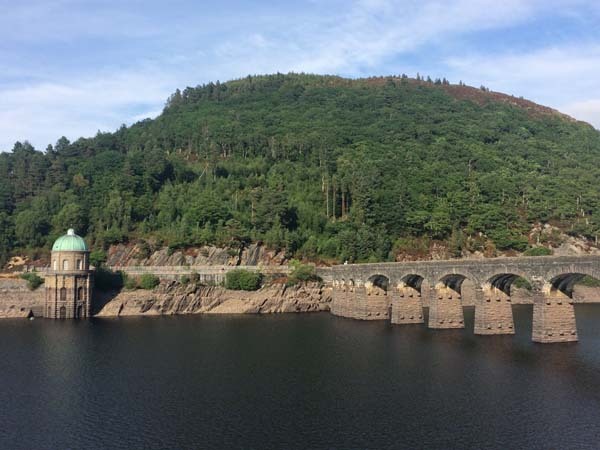 Esgair Perfedd* is a Roman hill fort overlooking Craig Goch, the highest in a staircase of glistening waterways and plummeting dams cascading to Caban Coch, four reservoirs down the valley (only they’re not cascading today; July’s a heatwave). Esgair Perfedd sounds, well, perfect, but the 10 or 11 miles is already sandwiched into a 120-mile drive home from north Wales and perhaps that’s enough for one day. I just don’t have an off switch. Now, this is a good thing in many ways; it gets me up at 6am to walk the dog I didn’t choose to have, run a business, take my kids rock climbing and write trails books on my weekends off. But sometimes, when the teen and teen in training are with the fun parent and I forget to stop for tea because there’s no one to cook for, I wonder if everyone else has an off switch. I think I must ask some friends about this (I also think I should change that last sentence to ‘I forget to stop for tea because there’s no one to cook for me.’ The teen and teen in training each cook once a week and their respective chicken curries and fish pies are renowned amongst all those friends I need to ask about off switches). Take the night before I drive to north Wales, for example, I usher Lionel into the garden for a wee and spot a few branches that need cutting back. Eight garden waste bags later, it’s 9pm and the neatly-labelled leftover chicken curry and fish pie are still in the freezer. But it’s okay not stopping in July, because July’s a heatwave and I notch up 97 miles out of the 1,000 I’m aiming for this year. The teen and nearly teen are on holiday with the fun parent, so I decide that driving to southern Snowdonia for a couple of days is the best way to fill that gap. I camp at the foot of Cadair Idris and heat up chicken curry as the valley turns a dusky rose, listening to the mewling of a bird of prey. I suspect it’s a buzzard but tell myself it’s a peregrine or, maybe, even an eagle. An eagle’s the very least I deserve after such a long drive. If the heatwave paused at Picws Du, it well and truly splinters on Cadair. I set out under prophetic clouds and, turning back at Llyn Cau to admire how far I’ve come, see only mist rolling up and closing the cwm behind me. 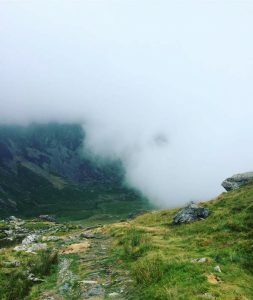 I plod upwards – Cadair Idris is a far harder climb than Snowdon – visibility narrowing to a few feet, until the endless drop to my right is just harmless orange lines on a map. I hear the teen’s sensible voice say: ‘Be careful Mum, don’t go anywhere dangerous.’ I also hear the teen in training. He’s whistling ‘Dumb Ways to Die’. At a stile handily marked with a grid reference (SH710 121; it’s a nice stile if you ever want to visit) I look into swirling grey where Pen y Gadair should be, sigh and turn back. And as I start the slow, scrambly descent into the cwm, I remember it would have been my wedding anniversary, had I not managed to find the off switch for that never-ending uphill slog. 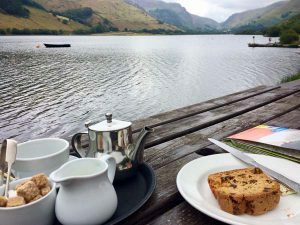 So I do what everyone should do on their wedding anniversary – preferably alone – and head for the Ty’n y Cornel Hotel, order a huge pot of tea and bara brith, and look for the meaning of life in the mist drifting over Tal y Llyn. The next day I rejoin the heatwave where I left it, somewhere south of Carno, and pitch up at Elan. Garreg Ddu and Pen y Garreg quieten my mind as I pass just one hiker and a couple of cyclists heading in the opposite direction. 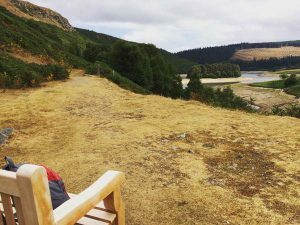 And it’s at the head of Pen y Garreg (or maybe it’s the foot of Craig Goch), after scrutinising my wondrously smooth new map and filing Esgair Perfedd away for ‘next time’, that I find Dorothy and Archie’s bench. One lived to 100 (or possibly 99), according to the dates on the inscription, and the other almost as long when they stopped visiting this spot. I wonder if they passed away on the same day or if one just couldn’t be without the other and gently followed, without too much ado. I eat my leftover bara brith, carefully wrapped and well travelled, and wonder if maybe Dorothy didn’t know where her off switch was either, but that was ok as she had Archie to tell her to sit on a bench and pass her bara brith, then they’d go home together and he’d cook chicken curry or fish pie. How wonderful to love someone so much, for so long. 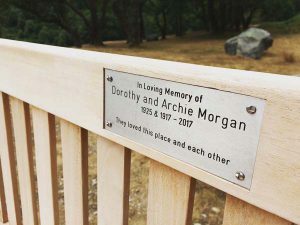 I sit on Dorothy and Archie’s bench for a long time, watching Pen y Garreg lazily yawn her way towards parched, emerald hills. In the middle of Pen y Garreg is an island, and her shores are so swollen by the heatwave they nearly touch the edges of the reservoir and I think I could just step across. I finish my tea, pack away my flask and set off towards the opposite bank and the long drive home, wondering all the while if I should have squeezed in Esgair Perfedd after all. * I get home and look up Esgair Perfedd on Google translate. It means ‘ridge of the entrails, or guts’. Sometimes, ‘next time’ doesn’t happen.